Why does this hill not get more visitors? As with most (I would guess) the reason for our visit to the Arigna area was to take the county top of Roscommon. Given that there are only three MV tops in the whole range, we decided to take in them all as part of a 22km hike on a fine Sunday at the end of April. There is no doubt, as three5four0 has already said, this is the finest in the range. Despite this, it is clear from the stats that only about half the county toppers make the short trip up to Seltannasaggart and less than half of these ventured on as far as Carrane Hill. For those of you who have made the trip to the area and have not taken in this summit you should have. Not that it is an exceptional peak, but it is far superior to the other two in the range, so if you have come over, you should bag it along with the other two and get a whole range in a day! Our walk started on the very banks of Lake Allen, near the miners way route and took in Seltannasaggart SE and its summit. We abandoned our original plan and headed straight on from here to wind our way through deforested areas and over ditches, drains and barbed wire fences. I would suggest to back track from the summit of Seltannasaggart to the track junction at G 903 195 A and head West South West from there along a track until reaching a junction at G 88657 19403 B, where you turn right. You have long since left Roscommon at this stage and are now walking through Leitrim on your way to Sligo. A small range that spans three counties! At the junction at G872 209 C hang a left and cross the county border into a wooded area, over the river and take your first right. 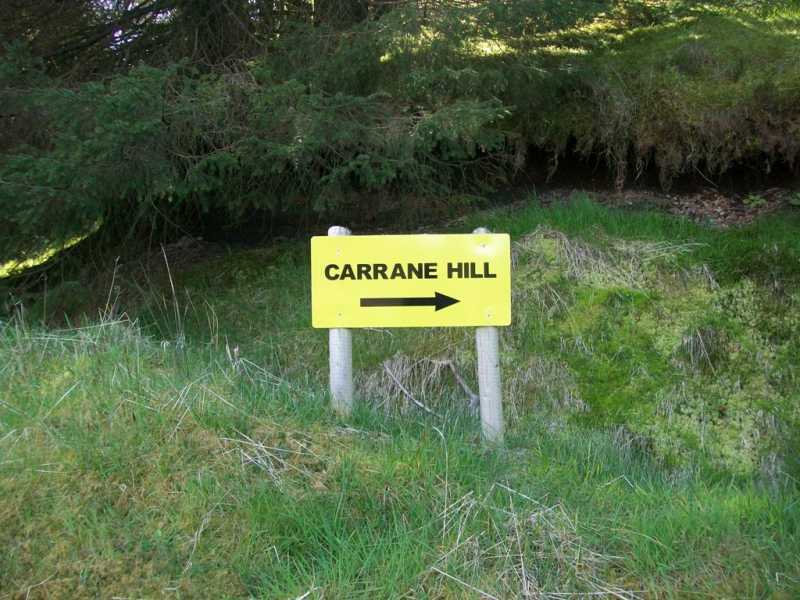 If memory serves me correct, it is around here that you will see the first of the big yellow signs that direct you towards Carrane Hill! I must apologies, as having had the phone with my GPS readings stolen in the mean time I cannot provide any further points. However, it is pretty straightforward, follow the tracks to the RSJ gate of yet another wind farm. Unlike most others in the area this one will recommend not entering! Hey, it was a quite Sunday afternoon, we had already walked 15km at this stage and our route out was getting a taxi from the small village of Geevagh! We walked on through until reaching a building near the summit from which we turned right and headed directly for the summit over open country. The Finest of the Arigna Mountains? Climbed Carran the same day as Seltannasaggart (& SE slope county top). Parked on the grass verge, just down hill from the start point mentioned by simon3. Followed this lane up, through a gate, past an abandoned farm and straight up hill. 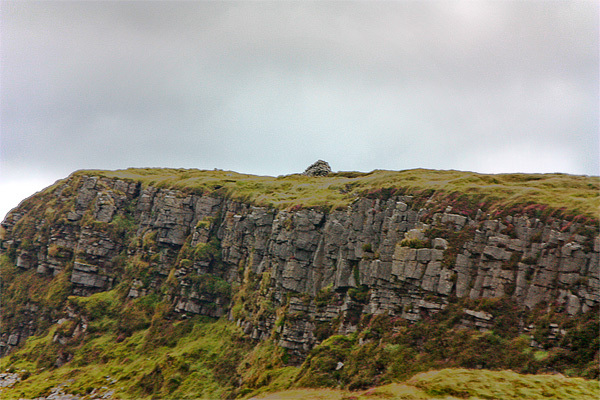 The summit gave fine views of the surrounding countryside and towards the Bricklieve Mountains. One place to start is G 84081965 E, which is about 1km SW of the summit. There's rich and varied vegetation on the way such as thick rushes and heather. 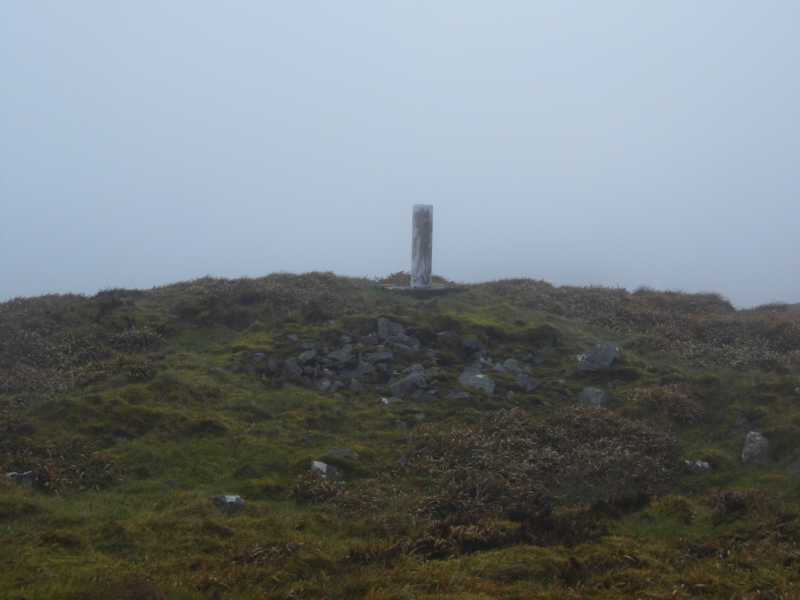 Carran Hill is a scarp which, unusually for Ireland, has its steep cliffy side facing SW.
A view of the summit cairn. Carran Hill also has a substantial windfarm on it.